In which aspect colors can reflect any Brand and how can manipulate the opinion and actions of users towards the Brand was always one of the most intriguing and debatable aspects of Brand presence and marketing. As it is common with a lot of depth analysis in major marketing areas, color theory is a topic of complexity and nuance, but splashy infographics rarely go beyond See ‘n Say levels of coverage. Green Lantern can’t turn lemons into lemonade and I’m left equally unequipped to make smart decisions about the spectrum which shades our world. But why is such a potentially colorful conversation so unwaveringly shallow? First let’s address branding, which is one of the more important issues relating to color perception and the area where many articles on this subject run into problems. But the truth is that color is too dependent on personal experiences to be universally translated to specific feelings. There are, however, broader messaging patterns to be found in color perceptions. In a study titled “Impact of color on marketing,” researchers found that up to 90% of snap judgments made about products can be based on color alone, depending on the product. Regarding the role that color plays in branding, results from another study show that the relationship between brands and color hinges on the perceived appropriateness of the color being used for the particular brand (does the color “fit” what is being sold?). 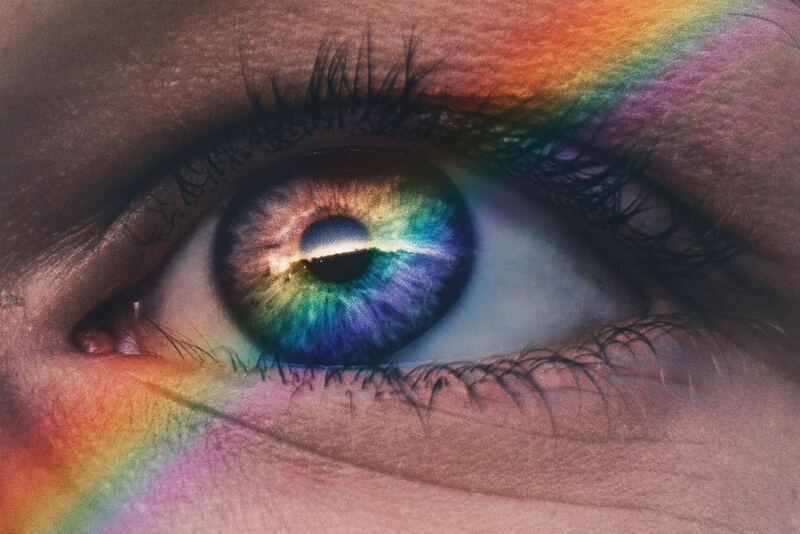 A study titled “Exciting red and competent blue” also confirms that purchasing intent is greatly affected by colors due to their effect on how a brand is perceived; colors influence how customers view the “personality” of the brand in question. Who, for example, would want to buy a Harley Davidson motorcycle if they didn’t get the feeling that Harleys were rugged and cool? Additional studies have revealed our brains prefer immediately recognizable brands, which makes color an important element when creating a brand identity. One journal article even suggests it’s important for new brands to pick colors that ensure differentiation from entrenched competitors — personally, I think we’re getting into minutiae without additional context, such as how and why you’re positioning against a direct competitor, and how you’re using color to achieve that goal. When it comes to picking the “right” color, research has found that predicting consumer reaction to color appropriateness is far more important than the individual color itself. If Harley owners buy the product in order to feel rugged, colors that work best will play to that emotion. Psychologist and Stanford professor Jennifer Aaker has conducted studies on this very topic, and her paper titled “Dimensions of Brand Personality” points out five core dimensions that play a role in a brand’s personality. Brands can sometimes cross between two traits, but they are mostly dominated by one. While certain colors do broadly align with specific traits (e.g., brown with ruggedness, purple with sophistication, and red with excitement), nearly every academic study on colors and branding will tell you that it’s far more important for colors to support the personality you want to portray instead of trying to align with stereotypical color associations. Consider the inaccuracy of making broad statements such as “green means calm.” The context is absent: sometimes green is used to brand environmental issues, like Seventh Generation, but other times it’s meant to brand financial spaces, such as Mint. And while brown may be useful for a rugged appeal — see how it’s used by Saddleback Leather — when positioned in another context, brown can be used to create a warm, inviting feeling (Thanksgiving) or to stir your appetite (every chocolate commercial you’ve ever seen). 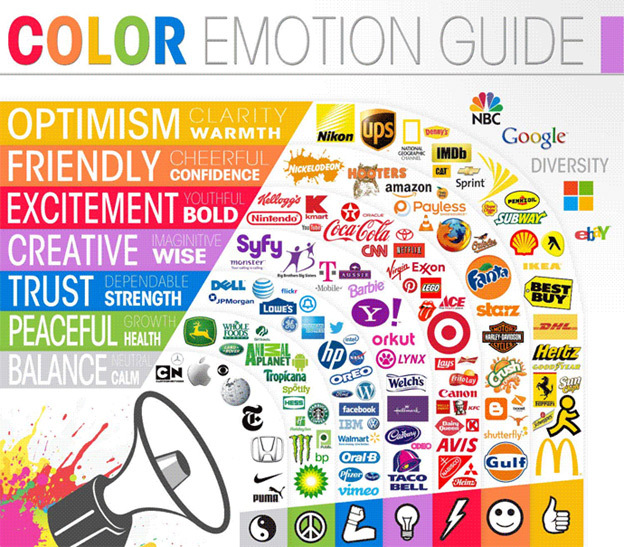 Bottom line: There are no clear-cut guidelines for choosing your brand’s colors. “It depends” is a frustrating answer, but it’s the truth. However, the context you’re working within is an essential consideration. It’s the feeling, mood, and image that your brand or product creates that matters. 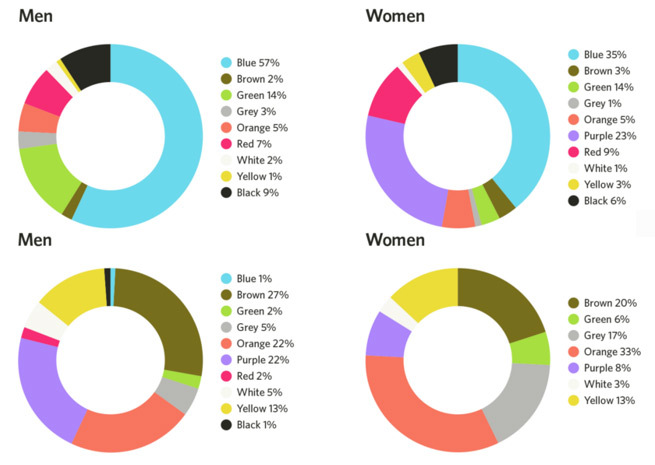 One of the more interesting examinations of this topic is Joe Hallock’s work on “Colour Assignment.” Hallock’s data showcases some clear preferences in certain colors across gender (most of his respondents were from Western societies). The most notable points in his images are the supremacy of blue across both genders and the disparity between groups on purple. It’s important to note that one’s environment — and especially cultural perception — plays a strong role in dictating color appropriateness for gender, which in turn can influence individual choices. Consider, for instance, this coverage by Smithsonian magazine, detailing how blue and pink became associated with boys and girls respectively, and how it used to be the reverse. Additional research in studies on color perception and color preferences show that when it comes to shades, tints, and hues, men generally prefer bold colors while women prefer softer colors. Also, men were more likely to select shades of colors as their favorites (colors with black added), whereas women are more receptive to tints of colors (colors with white added). Although this is a hotly debated issue in color theory, I’ve never understood why. Brands can easily work outside of gender stereotypes — in fact, I’d argue many have been rewarded for doing because they break expectations. “Perceived appropriateness” shouldn’t be so rigid as to assume a brand or product can’t succeed because the colors don’t match surveyed tastes. The psychological principle known as the Isolation Effect states that an item that “stands out like a sore thumb” is more likely to be remembered. Research clearly shows that participants are able to recognize and recall an item far better — be it text or an image — when it blatantly sticks out from its surroundings. Two studies on color combinations, one measuring aesthetic response and the other looking at consumer preferences, also find that while a large majority of consumers prefer color patterns with similar hues, they favor palettes with a highly contrasting accent color. 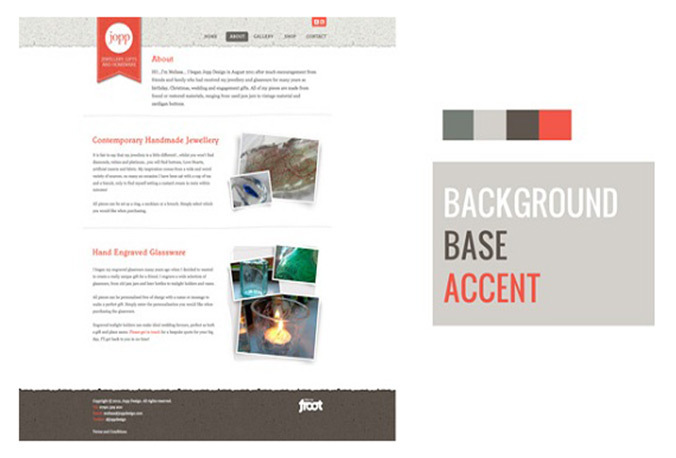 Another way to think of this is to utilize background, base, and accent colors, as designer Josh Byers showcases below, to create a hierarchy on your site that “coaches” customers on which color encourages action. Why does this matter? Although you may start to feel like an interior decorator after reading this section, understanding these principles will help keep you from drinking the conversion rate optimization Kool-Aid that misleads so many people. 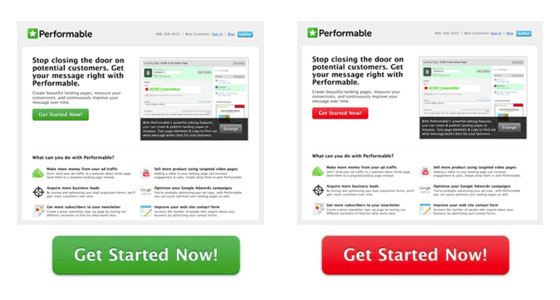 Consider, for instance, this oft-cited example of a boost in conversions due to a change in button color. 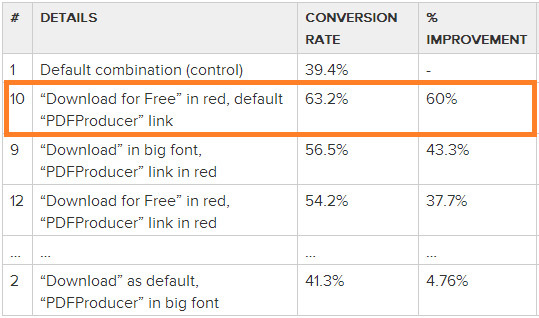 The button change to red boosted conversions by 21 percent. However, we can’t make hasty assumptions about “the power of red” in isolation. It’s obvious that the rest of the page is geared toward a green palette, which means a green call to action simply blends in with the surroundings. Red, meanwhile, provides a stark visual contrast, and is a complementary color to green. Example #10 outperformed the others by a large margin. It’s probably not a coincidence that it creates the most contrast out of all of the examples. You’ll notice that the PDFProducer text is small and light gray in color, but the action text (“Download for Free”) is large and red, creating the contrast needed for high conversions. A final but critical consideration is how we define “success” for such tests. More sign-ups or more clicks is just a single measurement; often a misleading one that marketers try to game simply because it can be so easily measured. Although different colors can be perceived in different ways, the descriptive names of those colors matters as well. According to a study titled “A rose by any other name…,” when subjects were asked to evaluate products with different color names, such as makeup, fancy names were preferred far more often. For example, “mocha” was found to be significantly more likeable than “brown,” despite the fact that the subjects were shown the same color. We’re at the end of this post and there’s still no cheat sheet for choosing the perfect color in sight. In fact, we may have raised more questions than answers. What a ripoff. Truth is, the kaleidoscopic nature of color theory means we may never have definitive answers. However, just because a topic is peppered with plenty of “maybes” and “sort ofs” doesn’t mean we should stop thinking critically about it. Use the research available to challenge preconceived notions and to raise better questions; it’s the one consistent way to reach better answers.